25/02/ 08 — Call for fundraising and Acquisition — Sceaux, Musée de l’Ile-de-France — The Journal Officiel of 23 February has published a fundraising appeal for the purchase of a painting by François de Troy representing The Banquet of Didon and Aeneas (ill. 1). Under the guise of a mythological subject, the artist in fact represents the court at Sceaux of the Duke and Duchess of Maine. According to the Mercure de France : “All of the Figures appear in their most exact resemblance, placed and arranged with all the grace, decency and appropriateness demanded by their various ranks and characters. A painting that could be termed the latest effort and an artistic masterpiece” . In studying the age of the children in the picture, Dominique Brême was able to date the canvas, exhibited at the Salon de 1704, between April and October 1702. The Duke and Duchess are represented as Dido and Aeneas while the other figures have not all been identified. Dido’s palace is imaginary. 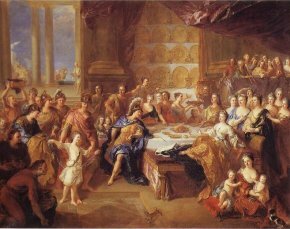 The painting was installed in the Maines’ apartment at the Tuileries Palace in Paris, then in the second half of the XVIIIth century, was moved to the château de Sceaux. In 1997, it belonged to an American private collector. The fundraising appeal is for 1,450,000 € ; the companies interested in responding will benefit from a tax deduction for businesses equal to 90% of their contribution . Due to his close relation to the Duke and Duchess of Maine and the court at Sceaux, François de Troy is an important artist for the Musée de l’Ile-de-France. The latter had already acquired in 1988 The Duchess of Maine’s Astronomy Lesson. 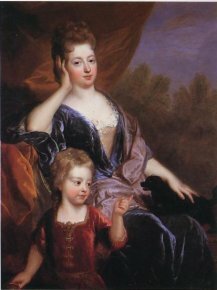 The museum has also just added to its collection another canvas by the painter representing The Countess of Brionne and her Son (ill. 2), donated by Monique and Elwin Milgrom on the occasion of the exhibition of their private collection at the museum . We did not comment on this show when it was in Sceaux, but we will soon cover it in an article during its stopovers in Arras and Bayonne . Quoted by Dominique Brême in his book on François de Troy which was published at the time of the exhibition presented in Toulouse at the Musée Paul-Dupuy from 7 April to 7 July 1997 (Dominique Brême, François de Troy, Somogy Editions d’Art 1997). Only for companies paying taxes in France, of cours. Donation offers, established according to the model set down by the “Instruction de la direction générale des impôts” 4-C-6-02 n° 184 of 24 October 2002, should be addressed to the Direction des musées de France, 6, rue des Pyramides, 75041 Paris Cedex 01, where the records concerning national treasures can be consulted by any company which is interested in doing so. Parcours d’un collectionneur. L’histoire, la fable et le portrait. Arras, Musée des Beaux-Arts from 1st March to 15 June 2008 and Bayonne, Musée Bonnat, from 11 July to 13 October 2008.